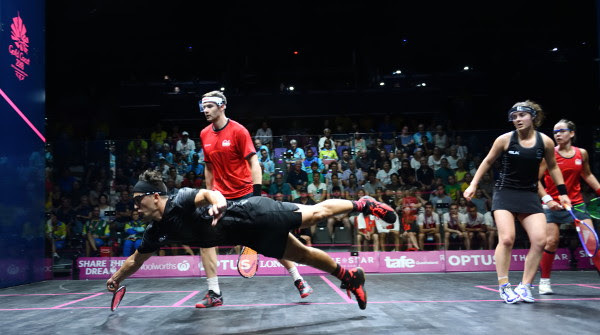 Less than 24 hours after the drama of the Singles medals finals day, Commonwealth Games Squash action switched to Doubles as players took to the wider courts in bids for glory in the Men’s, Women’s and Mixed events at Oxenford Studios in Gold Coast, Australia. There was a significant Pool upset early in the day in the women’s event when Rachel Arnold & Sivasangari Subramaniam, the ninth seeds from Malaysia, brushed aside top seeds Joelle King & Amanda Landers-Murphy, the reigning world champions from New Zealand. The match took place some 16 hours after King celebrated becoming the first Kiwi to win a singles gold medal – after surviving a dramatic and energy-sapping 78-minute final. But Arnold & Subramaniam (pictured above) clearly made no allowances for this, storming to a shock 11-10, 11-10 best-of-three victory (the standard doubles scoring) over the favourites. Rising Malaysian star Subramaniam, a 19-year-old Games debutante ranked 42 in the world, added: “We’ve played a lot of doubles in Malaysia – we did a lot of work to focus on doubles, so we were well-prepared. King and Landers-Murphy need to win their remaining match to keep alive hopes of making the knockout stages. King made up for her disappointing doubles start later in the day when she teamed up with men’s singles final runner-up Paul Coll to beat Papua New Guinea pair Lynette Vai & Madako Junior Suari 11-4, 11-7 in the Mixed event. The packed showcourt crowd enjoyed the first of three home wins on the day when fifth seeds Zac Alexander & David Palmer dismissed Cayman Islands pair Alexander Frazer & Jacob Kelly 11-6, 11-3 in an early Men’s doubles qualifier. “Just focussing on the men’s doubles – the one event for us – is great,” explained Palmer, a double Doubles gold medallist in the Glasgow Games in 2014 and the player with the most Games medals of all-time – eight in five appearances since 1998. “Having the extra courts to practise on has been the first time ever, at any Games, so I think that will definitely help us later in the tournament when the matches get harder. What is the motivation to keep coming back? “I’m coaching a lot now, but I miss that competitive side – I don’t get to play too many events for myself any more – and also the fact that it’s here on the Gold Coast in Australia. I remember how great it was playing in Melbourne. Level-wise I’m still OK to play, body is still pretty good. I’m still looking for another challenge and I’d love to get another medal with Zac. After resting during the singles, England’s Jenny Duncalf & Adrian Waller both made their first Gold Coast appearances by beating New Zealanders Amanda Landers-Murphy & Zac Millar (pictured above in a devastating dive during the match) 11-5, 10-11, 11-5 – recovering from the loss of the second game after being ahead by taking the decider. “Doubles always is fast and furious – it’s definitely more frantic than singles and you can’t afford to fall back on your feet at any time in the entire match,” said Duncalf, a former world No.2 making her fourth appearance in the Games. “We were pleased to come back in the third strong. Waller added: “We seem to have been waiting a week or ten days – so it’s great to get out there. There’s nothing that beats being on court. India’s defending Women’s gold medallists Joshna Chinappa & Dipika Pallikal Karthik squandered a lead in the first game to go 1/0 down before coming back strongly to beat Pakistanis Faiza Zafar & Madina Zafar 10-11, 11-0, 11-1. “They definitely played a lot better than we expected,” admitted Chinappa later. “We were 10-7 up so we obviously had no business losing that first game – but they had a few good shots and few winners. “We’re usually used to defending titles every year, but this is a four-year gap and a lot has changed over the last four years – the competition’s higher than what it was four years’ back. “We can’t take anything lightly so we’re just excited to be here. Yes, we do want to defend our gold but I think the main thing for both of us is to enjoy the whole process of trying to win the whole event. “When we got back home last time, there was a lot of spotlight on us, a lot of attention – which was great. We were just excited about it, not just personally but for squash in general. Men’s singles gold medallist James Willstrop was also back in action, partnering Declan James to an 11-4, 11-4 win over British Virgin Islands’ duo Joe Chapman & Neville Sorrentino. “I’ve obviously come off a heavy few days and Declan’s fresh,” said Willstrop. “I’m now very keen to make sure I’m ready to play as well as I can – I’ve got to recover well and forget about yesterday. Aussie doubles hope are being led by top men’s seeds Ryan Cuskelly & Cameron Pilley, the reigning world champions. Pilley came away with gold both in 2010 and 2014 – in the former a mixed gold with Kasey Brown and in Glasgow the men’s gold with David Palmer. 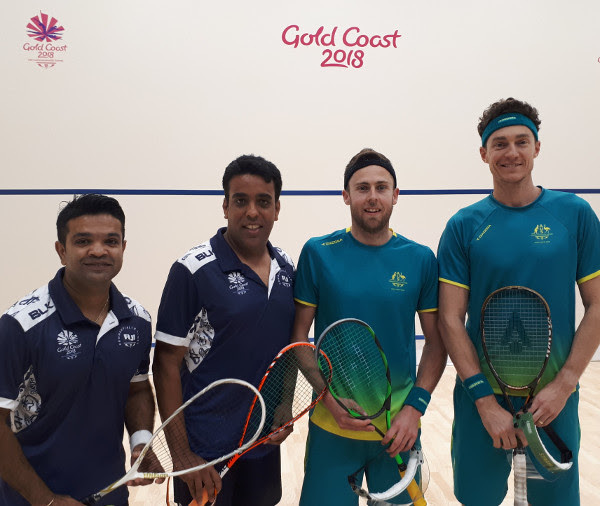 He and Cuskelly – who appears back to full strength after being forced to withdraw from the singles event with a leg injury – began their 2018 campaign in impressive style beating Fiji pair Sailesh Pala & Romit Parshottam (all four pictured above, pre-match) 11-3, 11-0. 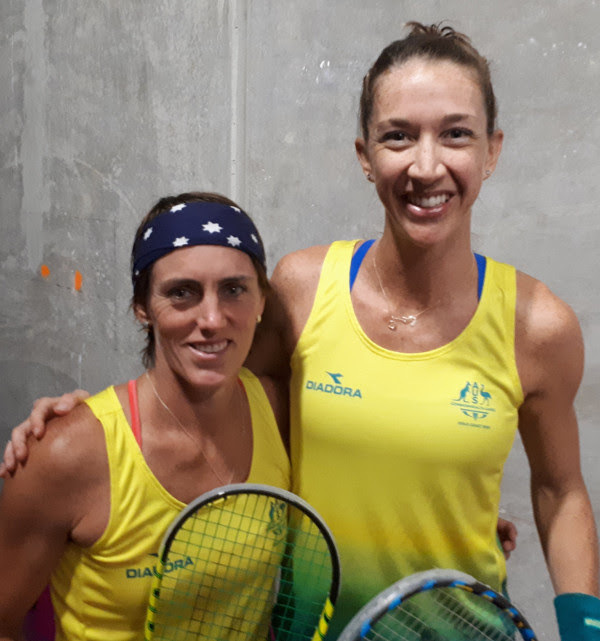 Aussie compatriots Rachael Grinham & Donna Urquhart (pictured below) were two of several players who played three matches on day one. Together the duo won two women’s doubles clashes – the final one of which saw the fourth seeds resist a spirited attack from Samantha Cornett & Nikki Todd, the fifth seeds from Canada, to win 5-11, 11-9, 11-4.